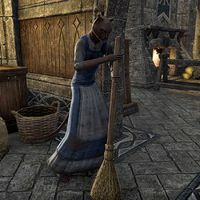 Hiyaza is a Khajiit who can be found in the Starfall Arcana in Vulkhel Guard. When you speak to her, she says, "So much to do. Please, speak with the Mistress if you're looking to sell." This page was last modified on 27 January 2017, at 07:35.